Times Beach, Missouri was a small town of 2,240 residents located 17 miles (27 km) southwest of St. Louis and 2 mi (3 km) east of Eureka, Missouri. The city was founded in 1925, based largely on a promotion by the now-defunct St. Louis Star-Times newspaper. A purchase of a 20 x 100 ft (6 by 30 m) lot for $67.50 included a six-month newspaper subscription. Times Beach was built along a floodplain near the Meramec River. It was initially a summer resort destination, but after the Great Depression and World War II, the town became a location for low-income families. Times Beach has been prone to flooding in its history and the first buildings were constructed on stilts. Times Beach has become infamous for an incident that occurred in the 1970s when a large amount of toxic dioxin was released on the town. In 1982, the disaster made national headlines, ending with the entire evacuation of the surrounding area. 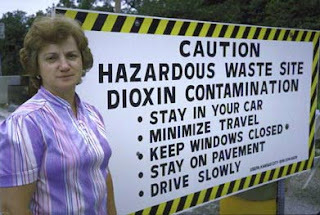 The incident remains the largest civilian exposure to dioxin in United States history. During the 1970s, people in Times Beach sprayed oil on the roads and in barns in order to remove dust. In 1971, the city employed waste hauler Russell Bliss to oil the roads in and around the town. The problem began when Bliss was hired by a local company named ICP to dispose of toxic waste. ICP was being paid $3,000 per load to haul away toxic material from the Northeastern Pharmaceutical and Chemical Company (NEPACCO). The company passed the deadly waste off to Bliss for $125 per load. NEPACCO operated a facility producing chemicals that were used for Agent Orange, a substance involved in the herbicidal warfare program of the Vietnam War. The waste clay and water produced in the Times Beach facilities contained levels of dioxin some 2,000 times higher than the dioxin content of Agent Orange. After obtaining the material, Russell Bliss began to mix the substance with his oil. He sprayed the toxic oil over dozens of sites in Missouri, including his own farm. In March of 1971, the toxic exposure resulted in the death of 62 horses, the owners of the stable suspected Bliss. After similar farms experienced problems, the Centers for Disease Control and Prevention began investigating the situation. On December 3, 1982, a soil sample was taken from Times Beach that showed dioxin levels some 100 times higher than what is generally considered hazardous to humans. On December 5, 1982, the Meramec River flooded, spreading the poison to separate locations in the town. The twin disasters caused the Federal government to buy out all residents in the area and to shutter the city, creating a toxic ghost town. President Ronald Reagan formed a dioxin task force and residents began to panic. Many illnesses, miscarriages, and animal deaths had been attributed to the poison. By 1985, Times Beach was evacuated except for one elderly couple who refused to leave, and the site was quarantined. Approximately 265,000 tons of contaminated soil and debris was removed from Times Beach and 28 other sites in eastern Missouri. The material was incinerated on the town’s former ground. Today, the area that was once Times Beach is Route 66 State Park.